It's that time again. 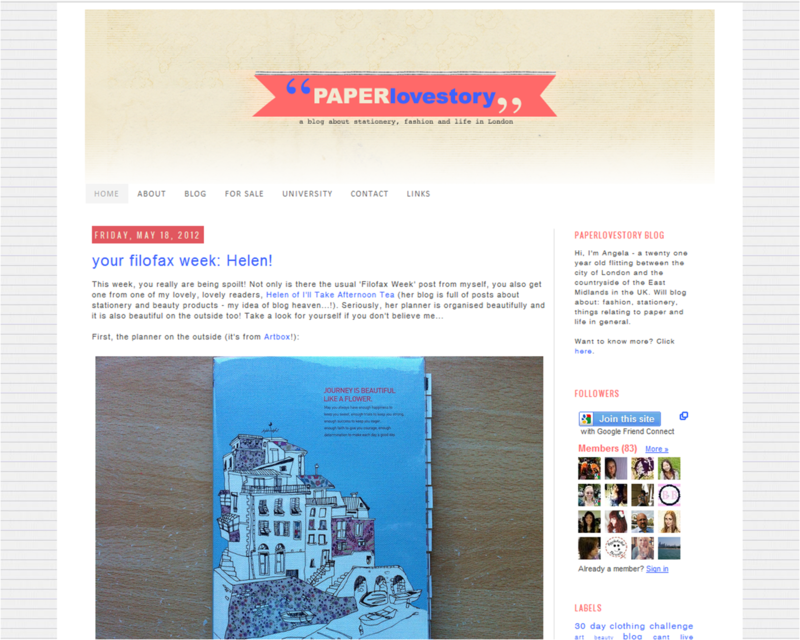 'Blog of the Week' looks at a different Filofax blog each week in the company of the blog's owner. This week, Angela walks us through Paper Lovestory. I've had blogs before from ones about fashion (briefly!) to a personal one but I felt the one I currently have is the most accurate representation of my interests. 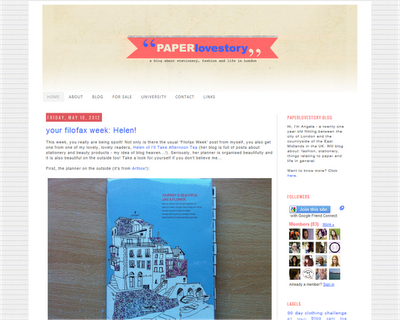 I am a geek and so blogging about stationery, GTD, organisation, Filofaxes, etc. comes naturally but the blog also gives me an outlet to occasionally blog about fashion too (but linking it into stationery, such as a post I did last month about the sorbet trend where I incorporated Filofaxes!). Also, I love engaging with people and a blog allows me to do that. My post about how I organise my lecture notes but it's closely followed by my filofax week #2. With the latter being a very new thing I've introduced (and I don't think any other blog does this so this is a unique thing - maybe why there are so many views??) so it's very surprising that it's only a few page views behind the one on lecture notes. I think my best posts are the one where I use more pictures to illustrate my point than words. And because I did love my Affair when I had it, it has to be this post where I showed how I set up my Affair. It is a Compact size too which is very different to the larger rings of the Finchleys I have so it was a challenge for me to set up in the first place and it was delightful to share the finalised set up with my readers. Just that people are reading it! I'm just your average geek who is still learning the ropes of life, organisation and everything else and the fact that some of the things I say interest people enough to come back and visit and also read what I have to say surprises me a lot! Also, how sometimes blogger's block can take over my mentality so that I don't have anything to write for ages. Hence another reason why I started the 'my filofax week' feature as that gives me something to blog about once a week. However, I usually have a few posts scheduled for at least the next three weeks so having a bout of blogger's block isn't too much of a problem usually. A blog from a girl who loves stationery, fashion and organisation. My thanks to Angela for participating.